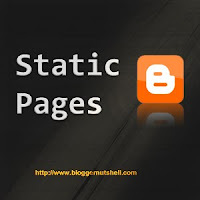 Finally Blogger has added the option to add Static Pages to your blogspot blog. This has to be one of the most demanded features by the Blogger users. However this feature has not yet been added to the main Blogger site. 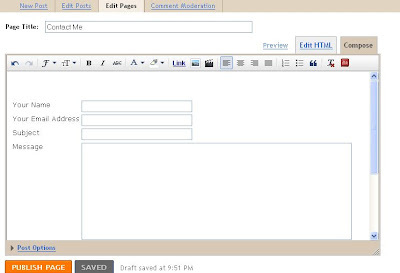 To use this feature, you have to login using Blogger Draft . Once you have logged in using Blogger Draft, click on Posting option and in it click on Edit Pages. Once you click on it, you will be taken to a page which is same as the one which you use for posting articles. However, instead of Post Title , you will have to add Page Title. As you can see from the image, there isn't any difference between the creating Posts and Pages. On the pages, you have option to allow or not allow comments and some other options. To publish the page, click on Publish Page. Then , you will reach a page where you have the option to add the published page as a sidebar widget, blog tab or add it manually. I will select the third option as I want to add where ever I want. However, it seems that the post page isnt working properly for my blog. This must be happening as this blog has automatic post summary feature. I tested this feature on a classic blogger blog and a blog which doesn't use automatic post summary. It was working properly on both the blogs. 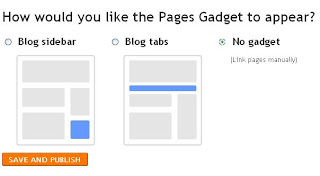 Try adding pages to your blogger blog and do give us your response about it.